Stellenbosch – Fleur Du Cap Unfiltered Chenin Blanc 2016 receives South Africa’s most coveted award for the cultivar, a Top10 recognition. “We are extremely proud of the whole team achieving such high recognition. These awards are only made possible through the dedication of our winemaking team and producers”, says Elmarie Botes; Fleur du Cap winemaker, white wines. The annual Top 10 Chenin Blanc Awards recognises the style, value and excellence in the category. Wine awarded this title furthermore carry a symbol of excellence and a promise of quality. 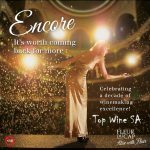 Fleur du Cap recognises the need of the greater community and have therefore decided to support Street Smart South Africa by donating their prize money to this wonderful organisation. “We are really thrilled to receive this generous donation from Fleur du Cap wines. StreetSmart SA partners with the hospitality industry to raise funds used to enable viable lives for street children and children at risk of landing on the street. 100% of all funds raised through our partners in restaurants, at cellar doors and accommodation establishments go towards education and family reunification programmes run by our local beneficiary organisations in Cape Town, Stellenbosch, Franschhoek, Helderberg, Paarl, Swellendam, Wellington, Plettenberg Bay, Knysna, George, Oudtshoorn, Johannesburg, Pretoria and Durban” says Melanie Burke, Chairman of StreetSmart SA. The Fleur du Cap approach is unconstrained. Using only meticulously selected grapes from the finest vineyards from across the Western Cape, Fleur du Cap produces a range of wines that offer a diversity of choice and diversity of taste. The grapes for the Unfiltered Chenin Blanc are sourced from a 30-year-old vineyard in Paarl and a 20-year-old vineyard in Darling. Both are dryland vineyards planted on Swartland shale. The Unfiltered Range wines are not pressured by filtration – letting gravity do the work- resulting in a rich, complex taste that abounds with fruit and flavour. The wine is crystal clear with a golden green hue. The nose appeals with notes of winter melon, white blossoms, sandalwood and fresh citrus. The palate is big and bold. It is well-rounded and balanced between fruit, acidity and the sweetness. This wine pairs well with a vast array of dishes ranging from rich salmon or lobster dishes to floral and fruity salads. Join the conversation on Facebook, Twitter and Instagram. Only 220 cases of the Unfiltered Chenin Blanc 2016 are available. Fleur du Cap wines, available at retail outlets nationwide, are found on many restaurant wine lists and can also be delivered to your door when purchased online through the Vinotèque.